Our thick fabric personalized pencil case does the trick with soft protective sides and a secure zipper closure. Design the Pencil Case Pouch exterior using our easy to use online design system, to create a custom pencil case designed by you for you. No more excuses for lost pens and pencils! Treat your kids to their very own photo pencil case that’s as unique as they are. To prevent tearing, we use 0.12" thick Neoprene fabric, so you can be sure that compasses or metal rulers won’t poke through and cause damage. When sorting out the kids for the school run, personalized pencil cases come in handy as you can easily identify which case belongs to which child. Your personalized photo pencil case is handmade with love. We print your photos or design onto the Neoprene fabric using a specialist printing process that locks in the color so it resists fading. The pencil case is then cut to shape and hand sewn together by our textile experts. Made to order, every personalized pencil case is unique. Great quality materials, great picture quality but the photo was more off center than my original order. My daughter will love this for school regardless. The bag I ordered turned out even better than I thought it would. Delivery was fast. Fun item! Submitted my order and was so extremely pleased that customer service took the time to let me know on of my pictures was blurry. They even circled which one on the picture! Shipping was super fast. I have already recommended their website and will do so again.Loved the product I received. Thank you so much, my zipper pouch was perfect. The graphic was perfectly placed and clear, and the zipper I selected matched it perfectly. Love the sturdy fabric as well. Super incredible fast shipping. Who Should I Buy a Personalized Photo Pencil Case For? They’re brilliant for encouraging kids to stay organised at school and reduce the number of felt tips and pencils they happen to ‘misplace’! The custom pencil case literally has 101 uses; moms all over could use it to keep their sewing bits and pieces in, ready for those random trouser rips, or your grandma would appreciate a discreet place to keep her medication. Compact in size, it’s an ideal accessory to have on hand. Like many of our products, these custom pencil cases come with a quantity discount, so buy more than one today and save money. A team of print technicians, craftsmen, and seamstresses all work in unison to ensure that your personalized pencil case is handmade to order, to the highest possible standards. Our strong neoprene fabric has a slight sheen that gives the colors a lift. Spongy and flexible, these personalized pencil cases for kids easily inside their school rucksack, locker or desk drawer – no matter how messy! Your pencil pouch pattern or photos are printed onto both sides, so choose the same for a consistent design or mix it up with different photos. Care: cold, delicate wash only, or regularly wipe with a damp cloth to maintain cleanliness. The pencil cases are made in a landscape orientation, so try to use images that are wider instead of longer. If you do have a portrait picture you want to use, choose a background color to compliment the image. For children, personalize your creative pencil cases with their favorite sports star, cartoon characters or animals. Or design a cute pencil pouch for girls using photos from movies they love to watch, or a photo of their celebrity teen crush. You can also think about what to put in your pencil case which might help you come up with an idea. If you’re using it for crayons and art equipment, for example, a kaleidoscope or abstract pattern would give you inspiration while you paint. 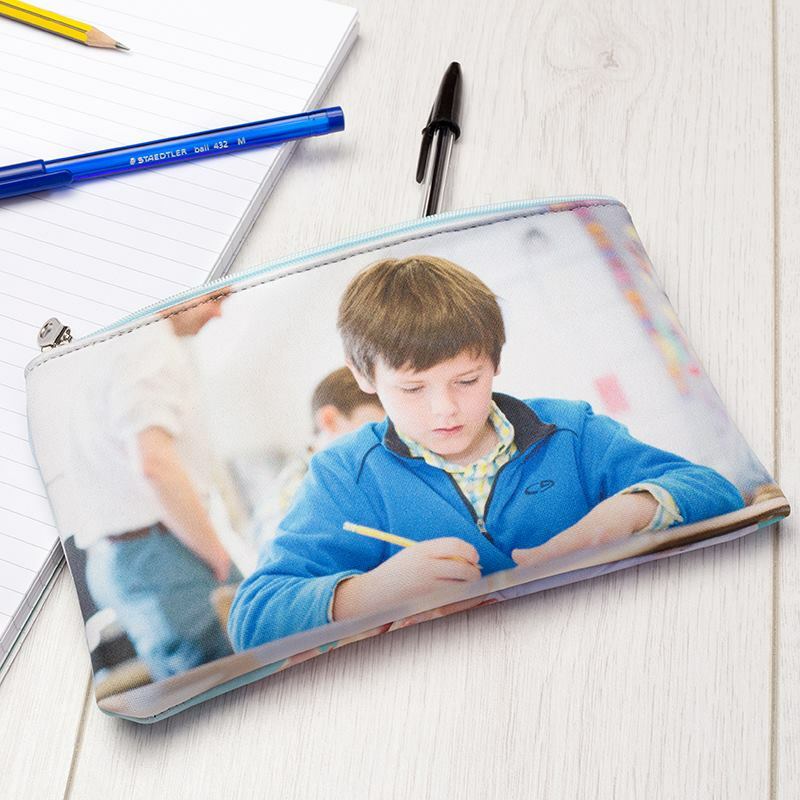 For school, pencil pouches customized with images of your kids favorite subjects could motivate them to always try their best. There are really no boundaries!